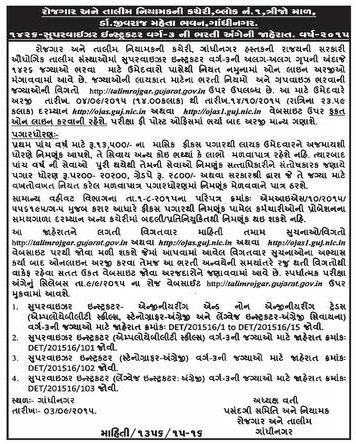 Directorate of Employment & Training Labour & Employment Department, Gujarat State has released Supervisor Instructor Posts Recruitment Notification Apply online Application Form on or before 14-10-2015. Industrial Training Institutes & “Industrial Training Centers” are training institute which provide training in technical field and constituted under Directorate General of Employment & Training (DGET), Ministry of Labour & Employment, Union Government of India. How to apply: Eligible candidates mat visit official site ojas.guj.nic.in and fill the application form.